Tonto Natural Bridge State Park, about an hour and a half from Phoenix, is believed to be the largest natural travertine bridge in the world. The bridge stands 183 feet high over a 400-foot long tunnel that measures 150 feet at its widest point. 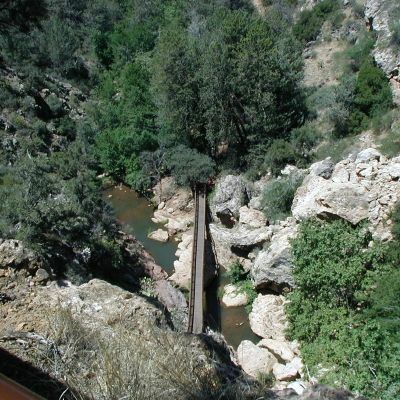 Visitors to Tonto Natural Bridge State Park can stand on top of the bridge or hike down below. Note: These pictures were taken in 2004. In February 2009 the Tonto Natural Bridge State Park was closed for repairs. This park begins opening on select weekends in May 2009. Check the official web site (link below) for schedule information.